Learn more about celebration of the Holy month of Ramadan in Egypt, its famous traditions common just to Egypt, food rituals and habits, kinds of entertainments available during the month and people's behaviour towards each other. Street decorated with flags during Ramadan. Selling fanooz-ramadan before the month. Traditional Ramadan sweets - atayf. Canon Ramadan at the Citadel. Ramadan is a special month for Muslims. It's a month of prayer and observance , more people will be performing gama'a (together) prayers at work and almost everyone will be reading from a small Qu'ran on the bus or underground and as soon as they get in to work. The concept of fasting itself is to promote solidarity between different social classes by forcing Muslims to experience what it is like to be needy and hungry. Every year Ramadan shifts 11 days afterwards as it is calculated by Lunar calendar and in different countries can be announced in different days. Usually 1 day different with Egypt. At the day Ramadan is announced, people are not allowed to eat or drink until sunset - they have to fast, read Koran and pray for the following 30 days. Even the working day is shorter during this month, all organizations finish to work at 2 afternoon. Everyone leaves work around the same time and everyone needs to get home at the same time. After sunset there will be the 1st meal - Iftar (breakfast). Usually all families gather together, especially in the first days of Ramadan, to eat together – it's a good old tradition of Ramadan. This month is a family and friends special where no one is left to eat alone. When you get to the feast, expect it to be just that and know that it is considered rude not to eat everything put on your plate. As in Egypt Ramadan celebrates in its own unique way that is why it is almost impossible to live in Egypt without taking part in the traditions that have become synonymous with the month of fasting. Perhaps that's because many of these traditions originated right here. The children's fawanees, the mosalsalat of modern television and after-iftar sweets blend together each year annually to create an atmosphere unique only to this time of year and this place on earth . Long before announcement of Ramadan children start to decorate streets and houses with coloured lamps and fawanees. As most of the streets in Egypt especially in Cairo are so narrow it's very easy to decorate them with a band of coloured lamps fixing them on the balconies of different houses starting from the 1st house and finishing at the end of the street. Also people are used to buy special lamps (fanoos) and put them in front of the entrances of their houses. For children and adults alike, these lanterns are part of the joy and magic of Ramadan, much like how the Christmas tree symbolizes Christmas in other parts of the world. There is a legend how fanoos appeared in Egypt. On the fifth of Ramadan in the year 358 AH (969 AD), the Fatimid Caliph Moezz El-Din EI-Allah was entering Cairo - the city his army had founded - for the first time. As he was coming after dusk, the residents turned out en masse with lanterns aglow to welcome him and celebrate his arrival. Since that day, the fanoos has become one of Ramadan's great symbols for Egyptians. While fanoos makers have been in business since Fatimid times, it wasn't until the end of the nineteenth century that the fawanees (plural of fanoos) took their final, popular shapes. One of the classic designs is the moqamas (the name of an Islamic architectural style), which takes the shape of a large star. Another well known style of lantern is the moatadel (upright), named so because the width of the top is equal to that of the base. There is also the mahroud (bent or slanted, pictured at left) because the width of its base is smaller than that of its top. The smallest lantern is sometimes called aadi (ordinary), because it is simple in decoration, and sometimes called sahari literally 'night light.' Sahari are typically not taller than 10 centimeters. The biggest fawanees are called kebir bi-aoulad (big with sons), because they are large, with smaller lanterns attached to the main structure. The craftsperson will inscribe their name on the larger ones. Some of these styles have fallen out of fashion - such as tar al-aela (the family frame) and abu negm (star-shaped). These fawanees are among the most expensive and are usually only made to order. The structure of the lantern is made from thin panels of tin, a material chosen because it is easy to cut and light in weight - important because the fawanees are often hung by chains from balconies and over streets. The top and base are decorated with intricate painted or engraved designs, complemented by glass sides in varying shapes and colors. The dome of the lantern is formed from many thin tin plates that are carefully placed beside each other. Outdoor fawanees are often wired to hold light bulbs. Some lanterns, usually made with heavier metal frames like copper or brass, are designed to hold candles. In these cases, there is a door that opens from the side or a removable bottom so that you can place the lit candle inside. 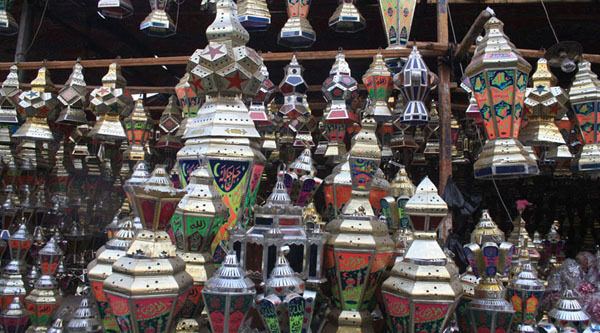 The lantern industry is centered in the Darb EI-Ahmar and Berket El-Fil districts and El-Saad Street in Sayeda Zeinab. The craftsmen start making the lanterns directly after the end of Ramadan, with production reaching full swing during the period just preceding the following holy month. Throughout the year you can find the best work of Cairo's fanoos makers in the Taht El-Rabe district near Attaba. The price of a fanoos in the 1960s ranged from three piastres for the smallest one up to 60 piastres for the largest. Nowadays, the price will range from LE 1-2 up to LE 30. One more tradition common just for Egypt is TV serials. The best of them are shown just in Ramadan, some continue for a couple of years. Children can enjoy with a cartoon that became also traditional in Egypt and is shown only in Ramadan – Bakkar. During Ramadan people are used to cook a lot, and it's known that during this month people waste more money than during any other month of the year. One feature of Ramadan is charity (mercy) tables which are prepared by all big and small restaurants during the whole month. A lot of different meals are cooked during the day, by the sunset tables are laid on and food is waiting for all who found himself in the street at the time of the call. Many people do not even cook and eat at home they go to such places to enjoy their evening. 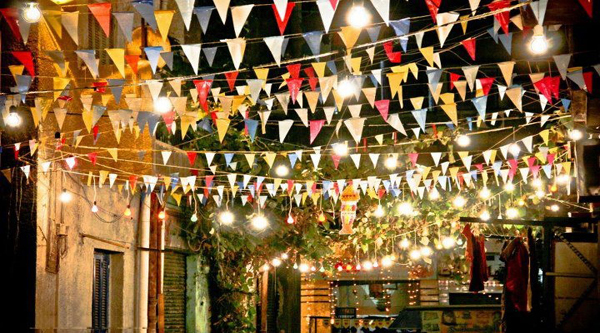 The best place to experience this tradition is Khan el-Khalily Bazaar. Many people go there before Iftar just to spend nice evening in a friendly oriental atmosphere and to enjoy with food. Some traditional kinds of sweets and drinks people can enjoy with just during the holy month of Ramadan and never after. For example "Kunafa", Egyptians are used to eat kunafa for sahur (meal before sunrise around 4-5 o'clock in the morning). It can be made in different ways and it's easily found almost everywhere in the streets during this holy month. Another favourite sweet is "ataif" - pancake with different nuts inside and in syrup. As for Favorite Ramadan Drinks they are very good and useful for anyone who is fasting. Not only are traditional drinks great thirst quenchers, they also contain a slew of active ingredients to make up for any disruption caused by your new Ramadan diet . The most famous one is ‘amar el-din (apricot juice) - The most traditional of Ramadan beverages, it is made from dried apricot paste. Physician and philosopher Avicenna (known in the Arab world as Ibn Sina) rightly praised dried apricots as thirst quenchers and antidotes to diarrhea. Qamar el-din aids indigestion, regulates metabolism and is packed with vitamins A, B and C, as well as calcium, iron, potassium and phosphorous. A perfect way to start iftar, it produces enough of a sugar rush to get the digestive system working without over stimulating it. Qamar el-din can, surprisingly, soothe jumpy nerves and stress, so it's great after a hard day at work. The strangest of its components is Folic acid, which helps fetuses grow; super for pregnant women . This tropical fruit tree has one of the highest levels of carbohydrates and proteins found in any fruit. It is the perfect beverage for diabetics, as it regulates blood sugar and cholesterol levels. It is also extremely rich in vitamin C, which boosts the immune system and is high in beta carotene. Other essential minerals found in tamr hindi include potassium, phosphorous and calcium . Do you know that a cup of hibiscus tea contains 17 percent citric acid and half as much vitamin C as an orange? Not surprisingly, it helps to boost and strengthen the immune system, which can be put under considerable stress while fasting. Speaking of stress, hibiscus is also widely used to regulate blood pressure, which can fluctuate between low during fasting and high after iftar. Known in hot regions of the globe as an effective thirst quencher, hibiscus reduces the buildup of fatty deposits in arteries and reduces blood cholesterol levels. Like cranberry juice, it is used in treating urinary tract infections and aids in regulating blood flow. Other properties in the herb help maintain the blood sugar balance in the body . You can drink it either hot or cold. Today, laban rayeb is one of the most popular drinks in the Middle East. Recently, it has found its way to Egypt, where its intake is generally restricted to this time of the year. It's a well-known fact that friendly bacteria found in live yogurt can aid in digestion, as well as help to clean the intestines and digestive tract, all of which can be necessary to treat an upset stomach after a few days of heavy iftars and sohours. Because it requires no added sugar, those watching their waistlines tend to prefer this creamy drink . Another acquired taste, kharoub potentially reduces cholesterol, aids digestion and acts as an antioxidant. Pinitol, an active component of kharoub, has been shown to regulate blood glucose and is especially recommended for diabetics. Milk with dates is usually taken before the iftar after the call to break the fast. Dried dates are put in milk for a night or so to drink and eat the next iftar. Mahalal juice is one of the favorite drink during Ramadan. It is salty water from pickles. You can buy it everywhere in the streets of Cairo during Ramadan and never after. Before sunrise people are used to have one more meal called “sahur”. Usually it is a light meal consists of some yoghurt and favourite Egyptian sweets – kunafa. In the past it was announced by special people (especially in the old times, now it's so rare to see them in the streets of Cairo but still possible in folklore areas) who wondered along narrow streets of the city before sunset with a drum and woke people up not to miss sahur with the following words “misaharaty” or a song. By the end of Ramadan these guys were paid by people of the aria they were wondering around. At the end of Ramadan according to the customs and traditions people prepare presents (edeia) for their relatives, traditionally it is clothes and dresses. Some days before the feast female members of a family go shopping to buy new dresses, new home clothes and so on, as everything on the day of feast must be new. Also all Muslims are required to pay special Muslim tax (alms) – zaka'a. You can pay to any poor creature in the street who may need money or give money to any mosque or any organization you think may need it. In fact it is up to anyone to whom pay the money. Ramadan finishes with a feast called Bairam - a big celebration continued for 3 days. During the 1 st day of Bairam all families gather together to celebrate the Ead and according to Muslim tradition all adult members of the family give certain amount of money to children and to those members of the family who does not work. And again, there is a traditional kind of sweets which you can taste only during Bairam and never after. It is “kakh”. Usually all female members of a family gather together some days before the Ead is announced to cook this kind of cookies. After it's done and baked in the nearest oven (people are used to make a big quantity of kakh, so that they are not able to bake it at home and that is why they go to the nearest oven to bake it and to chat with the neighbors on the way) female members go to their neighbors and offer them kakh. It is also offered to any guest who enters your house during Bairam along with a traditional drink. As neighbors are used to visit each other during Bairam each family keeps at hand some sweets and drinks to offer to anyone entering their house.